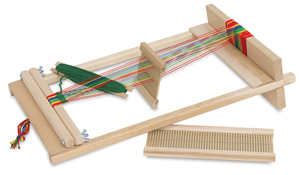 This is an excellent loom for the beginning weaver. Use it to teach the principles of weaving and textiles. Weave projects up to 10" wide × 3 yards long. Constructed of hard maple, the loom comes fully assembled, with a 4" wide project actually started. Features include 4" and 10" rigid heddles, a shuttle, and instructions.